LetsGoPens.com • View topic - Anyone into landscaping? 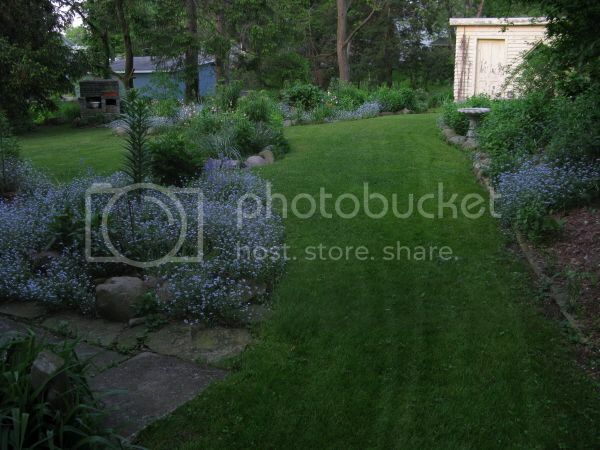 I have a large section of my yard that I want to turn into a big, wild-looking garden area. It's an extremely shaded area (virtually no direct sunlight) and I'm struggling to come up with plants, bushes, etc. which I can use. I was planning on getting English Ivy to use as a ground cover (along with some mulch), but I want to spice it up some more interesting vegetation too. I'd also like to make some rock features, maybe some benches, etc. 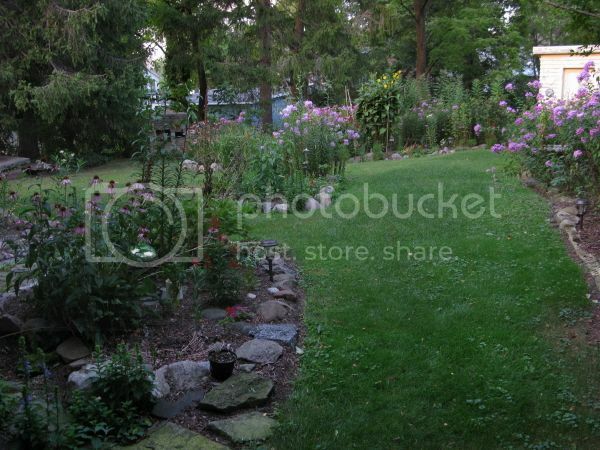 Is anyone here into landscaping or can you recommend a good forum to share ideas? The wife likes Sunset and Southern Living magazines for ideas. Maybe there is a publication similar in nature for the east? These are from Home Depot - both HD and Lowes have awesome forums. I'm not much of a plant guy. I don't recommend English Ivy - it will take over the whole yard eventually and it's a pain to eradicate. I've spent a lot of time ripping up almost 1/4 acre of it. A few good perennials I have used are different varieties of ferns, hosta, pulmonaria, and astilbe. I really enjoy landscaping. Let me try to think about some shade plants. Most of the plants that I like require at least some sun. My favorite, I think, is the weeping blue atlas cedar. I have one that is in half-sun, and it is doing fine. I would personally suggest strongly against going with a ground cover. It will make remulching torturous, and the stuff can be utterly impossible to control. There are a few problems I see all the time with amateur landscaping (and I am by no means an expert): planting things too close together, planting things all in the same line, having no shape (both horizontally and vertically) to landscaping beds, i.e., rectangular beds that are completely flat against a house do not look very pleasing. Undulating or rolled beds with curves and shape to the actual cut out of the bed look much, much nicer in my opinion. I ripped out horribly ugly yew trees from my house when we moved in, and when I built the landscaping bed, I used about 3 tons of top soil to add height to the bed. I would also consider double layering fabric. Its much easier to do when you initially install than it is at any point after that. Dude........ I saw the thread title and thought it said "Anyone into lapdancing?" tifosi77 wrote: Dude........ I saw the thread title and thought it said "Anyone into lapdancing?" Thanks for all the replies! I've heard ivy can be invasive so I was a little torn on it. My property is right against a large section of woods so I want to keep everything natural looking. I don't want it to look too "perfect" if that makes sense. Ideally, my vision would be to have it look like an English garden that was left to run wild. That's why I was thinking a ground cover would be nice, rather than nothing but mulch. 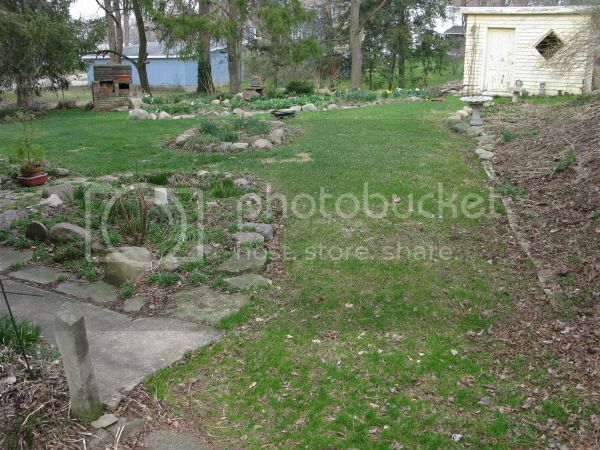 I'm converting a pretty large section of the yard to this, probably 800 sq. feet or so. Right now, all of the yard along the woods is just a mess. Patchy sections of grass, mud and moss. It's very wet and soggy, even in the summer. I actually wouldn't mind putting in a fire pit/patio area in one section but the ground is pretty uneven and I'm pretty sure leveling it off is beyond my current skill set. tifosi & shad - You're both pervs. 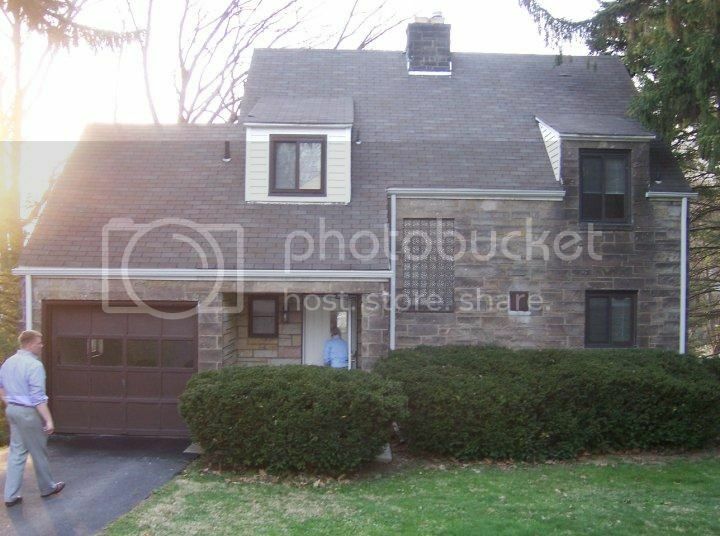 Here are pics from my house of before, middle, and after. The angle of the after pic doesn't really show you the height of the bed, but you can see that for things to look good for many years down the line, you need to be abundant with the space you give things. The tree on the left is a Tamukeyama japenese maple (very hardy) and the smaller plants are some variegated thing I can't remember. 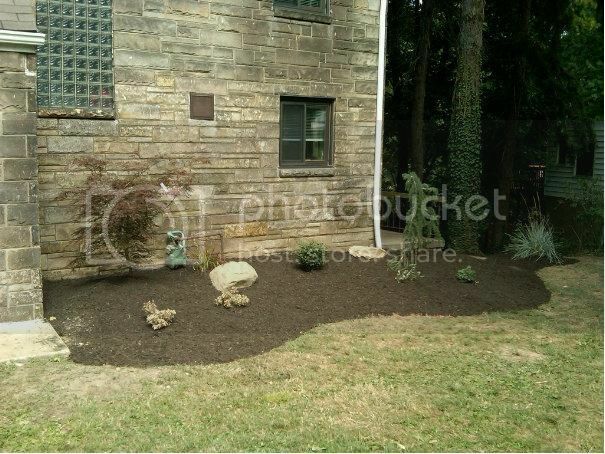 I used blood grass behind the large stone in the middle to eventually cover the gas meter (which it now does). The middle tree is a dwarf burning bush -- I'm not crazy about this tree to be honest and would like to replace it next year. 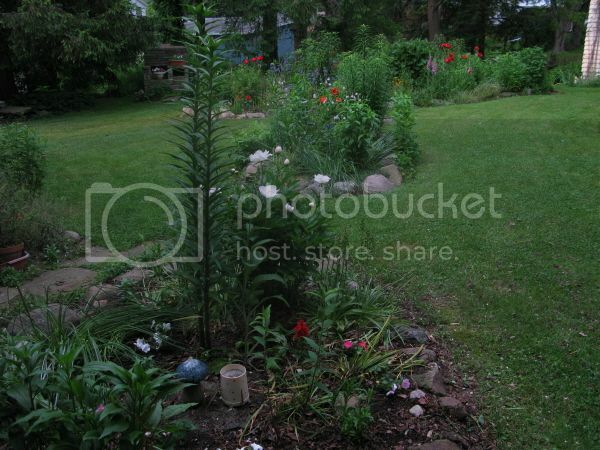 The right is the weeping blue atlas cedar with red flower columbine in the front. Then some ornamental blue grass on the edge of the bed, which goes down around the side of the house. By no means an amazing bed, but I was pretty happy with it. Planting in threes is also a good suggestion. The maple + two variegated plants in a triangle. Triangle for the two feature trees and the middle feature-ish tree. Three columbine in a triangle around the weeper, etc. I don't have a picture handy from this summer, but things have filled in nicely. interesting. i like the house. got a picture handy yet? Can't seem to find one, must be somewhere on my wife's computer. This picture at least shows how much the japanese maple has filled in. Wow, those tomatoes in the wagon are huge, Kraftster! 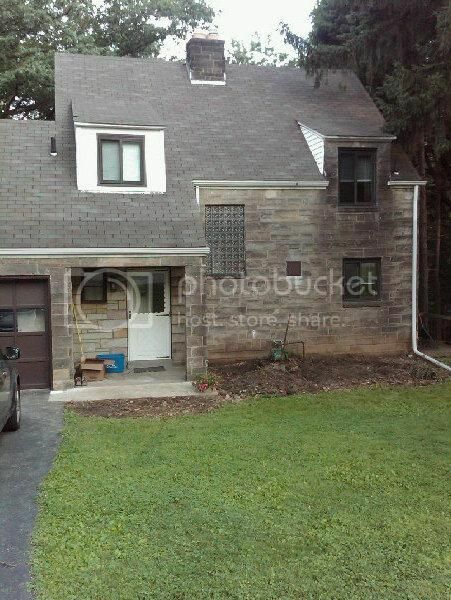 The house looks much better without the yews. I occassionally pee on my neighbors hedges, but I wouldn't say I'm "into" it. I have been using Helpful Gardiner for about a year. Great forum to bounce ideas and ask questions! 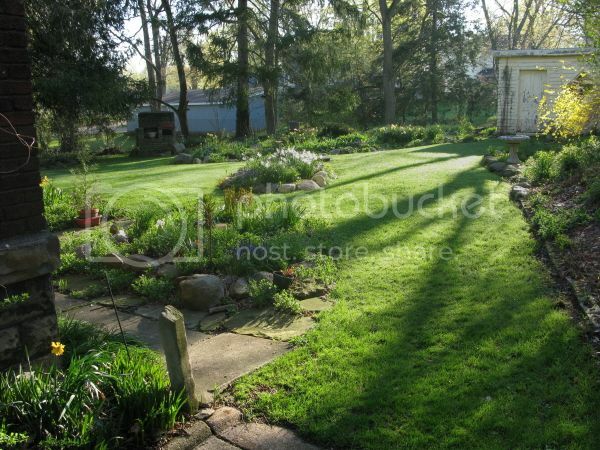 If you're ever near Johnstown and need some inspiration, let me know, as my backyard has a lot of planted, natural looking areas. Japanese maple tree - mine lives quite successfully in a complete shade (behind the north wall of the house). Nelly Stevens Holly: I have a huge forested lot that was hit pretty hard during the major 2007(?) ice storm. Since then, I started losing many old trees that simply could not recover. This year, I plan to plant a decent number of Nelly Stevens hollies (together with sugar maples) to return the lot to its former glory. I was told that those hollies will be able to thrive even in shaded areas, and that they grow pretty fast. If you google their pictures, you will probably see that they are often cut into various shapes for privacy screens, but if you let them "live", they actually grow into quite tall, "normally" shaped bushes. I've discovered the hard way that what works in western PA doesn't necessarily work in Charlotte, NC. And the springs are so weird here - summer one day, winter the next. Still haven't gotten the hang of it in terms of landscaping in the South. It wouldn't surprise me to see either of those threads. Hockeynut! 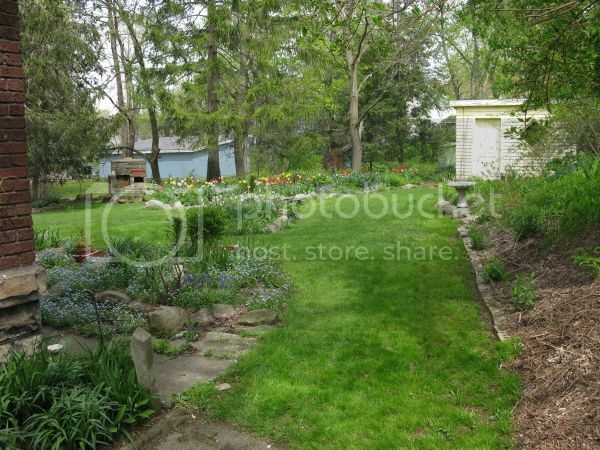 wrote: My property is right against a large section of woods so I want to keep everything natural looking. I don't want it to look too "perfect" if that makes sense. Ideally, my vision would be to have it look like an English garden that was left to run wild. Pretty much what I've been trying to achieve here. So far I've converted grass and ivy to gardens on ~1500 sq ft total split between several beds. Agree with Kraftster on giving the beds shape and texture, curving bed lines and plants of varying heights make for a much more natural look. Planting a wide variety of bulbs and perennials can give a continous bloom from early March through the first hard freeze. I'd guess we have at least 50 different species of bulbs / perennials, planted over the last ten years. We also pot up or plant out about a dozen flats of annuals every year for windowsill pots / hanging baskets and to give the beds some extra color. Did you reseed your grass or just fertilize the hell out of it? mac5155 wrote: Did you reseed your grass or just fertilize the hell out of it? I haven't done either in years. It just fills in by itself well enough by May every year. Apparently, the huge Black Locust in the neighbor's yard gives me all the free fertilizer I need.